Residents of Redrow’s prestigious new housing development in Lytham St Annes are enjoying attractive and warm homes, thanks to Swish Window and Door Systems. Redrow’s impressive new development at Lytham Quays comprises 10 exclusive villas; a range of luxury apartments, many with fabulous sea views; plus a wide selection of three and four bedroom family homes – traditional built properties that have been sympathetically designed to perfectly complement the charm and character of the Lytham area. Swish’s ‘A’ rated casement windows were used for the family homes and villas in the development, while curtain walling was also used for the villas, plus the apartments. Beck Brown coloured foils were utilised for the curtain wall and windows, in order to create a modern, aesthetically appealing finish. Some of the larger properties on the development also feature sliding patio doors, which adhere to Secured by Design specifications. Lesley Myers, Redrow Area Manager, said: “We specified Swish curtain walling windows and doors for the Lytham Quays development due to the company’s longstanding reputation for high quality window and door solutions. Andrew Reid, Commercial Sales Director for Swish Window and Door Systems, concluded: “Not only do Swish systems look good and increase insulation, they are also safe, secure and reduce noise. All this, as well as being a well-known and well-respected brand in the industry, means that we were perfectly placed for this prestigious new build development. 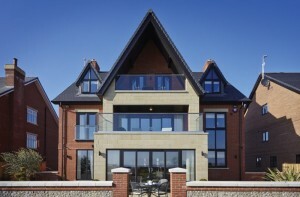 For more information on Swish Window and Door Systems, please visit www.swishwindows.co.uk.